TOWSON, Md. — For Alex Thomas the past couple weeks have been grueling. “It's not been easy. It's been a lot of steps. A lot of rehab. A lot of extra treatment,” he said. But Saturday made it all worth it. 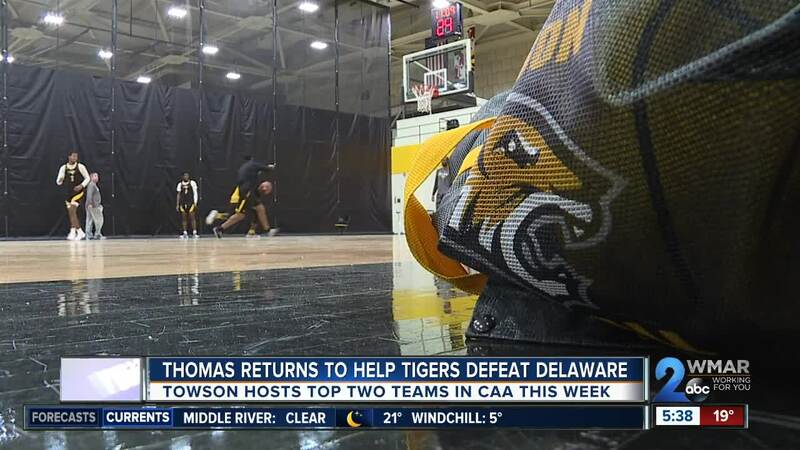 After missing two games with a torn labrum in his right hip, the Towson forward got back in the lineup Saturday and hit the game-winning jumper with 22 seconds left, lifting his Tigers (6-14, 2-5) past Delaware 64-63. “He had nine (points) and eight (rebounds) for us, big shot. He's an unbelievable kid. Great student. He's a great teammate. He's a great person, comes from a really good family,” said Towson Head Coach Pat Skerry. The win over the Blue Hens saw Towson overcome an 18 point first half deficit. Now the Tigers prepare for a pretty daunting next couple of games. They host preseason Colonial Athletic Associatoin favorite Northeastern on Thursday and Hofstra on Saturday. The Pride has won 14 straight games. Skerry and the Tigers will be happy to start one of their own.